Flash forward to later in the afternoon, when ancient languages filled a Pettengill classroom for a session featuring works by Greek and Latin students of Laurie O’Higgins, the college’s Euterpe B. Dukakis Professor of Classical and Medieval Studies, including a student video that transported the audience to ancient Thebes. 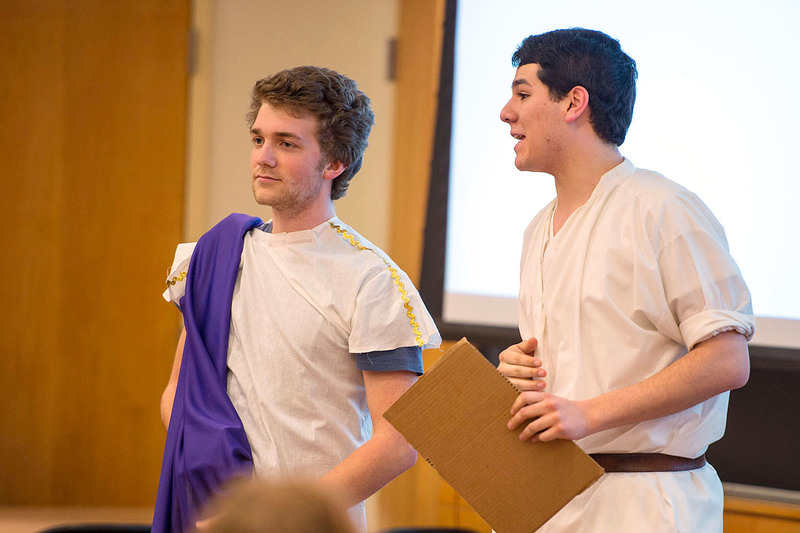 Chuck Munn ’14 (left) and Andrew Carranco ’14 perform Plautus’ comedy Captivi in the original Latin during a Mount David Summit presentation. Munn and Carranco are majoring in classical and medieval studies. Photograph by Mike Bradley/Bates College. First up were Latin poetry students, with Michael Creedon ’15 of Medfield, Mass., giving an English introduction of the prologue to Plautus’ comedy Captivi. Plautus was a Jon Stewart of his day. Creedon explained how one could almost see the Roman playwright as a Jon Stewart of his day, offering ironic political commentary and incisive inquiry into familial love and loyalty among masters and slaves. Creedon then joined fellow students to execute the prologue in costume, shackles and graceful Latin. Behind them, student-prepared subtitles appeared on a projection screen. Following the Latinists came students of ancient Greek and their video — directed and edited by John Goodman ’15 of Larchmont, N.Y. — featuring two scenes from Euripides’ Greek tragedy Bacchae, filmed during a late winter snowstorm and featuring student-prepared subtitles. In one scene, the storm rages poetically outside an Olin Arts Center studio as Dionysus contemplates his options with Pentheus, the arrogant King of Thebes. In the second scene, the Gomes Chapel offers a dramatic, ominous setting for an encounter between the disguised young god Dionysus and Pentheus, who ignorantly refuses to accept the whippersnapper and his mysterious Bacchic cult. The Bacchae scenes were performed in ancient Greek by Carranco, Munn, Janée White ’13 of New York City; Andy Cannon ’15 of Greenwich, Conn; Jackson Fleming ’15 of Boston, Mass. ; Henry Lee ’15 of Sag Harbor, N.Y.; and Mike Spinosa ’13 of Charlottesville, Va. The English subtitles were prepared by Fleming and Spinosa, with assistance from O’Higgins.